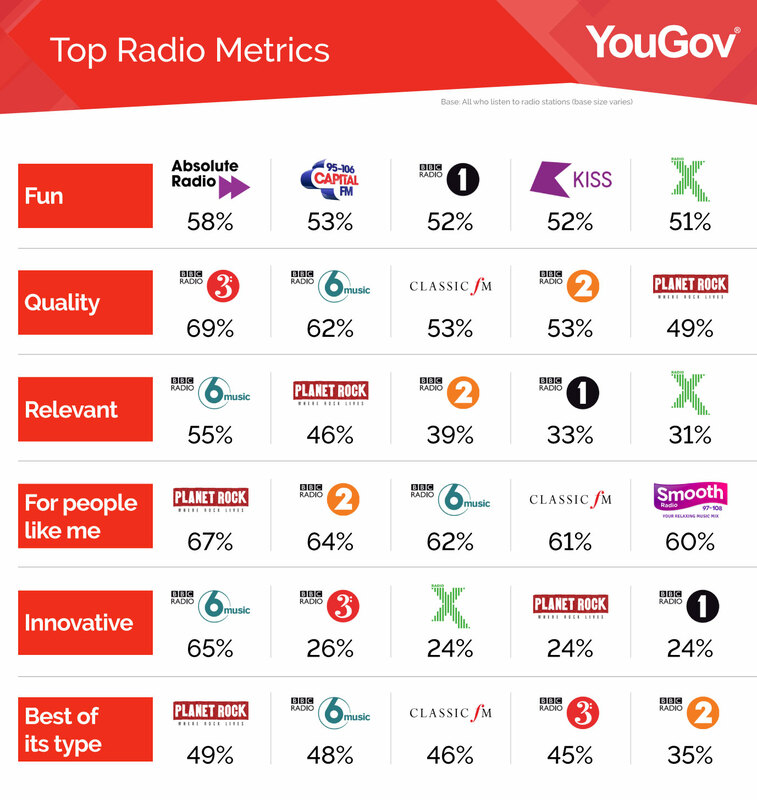 October 25, 2018, 12:23 p.m.
6 Music seen as an evolving and unique music station, BBC Radio 3 regarded as the best for Quality, while Absolute Radio is thought of as fun. 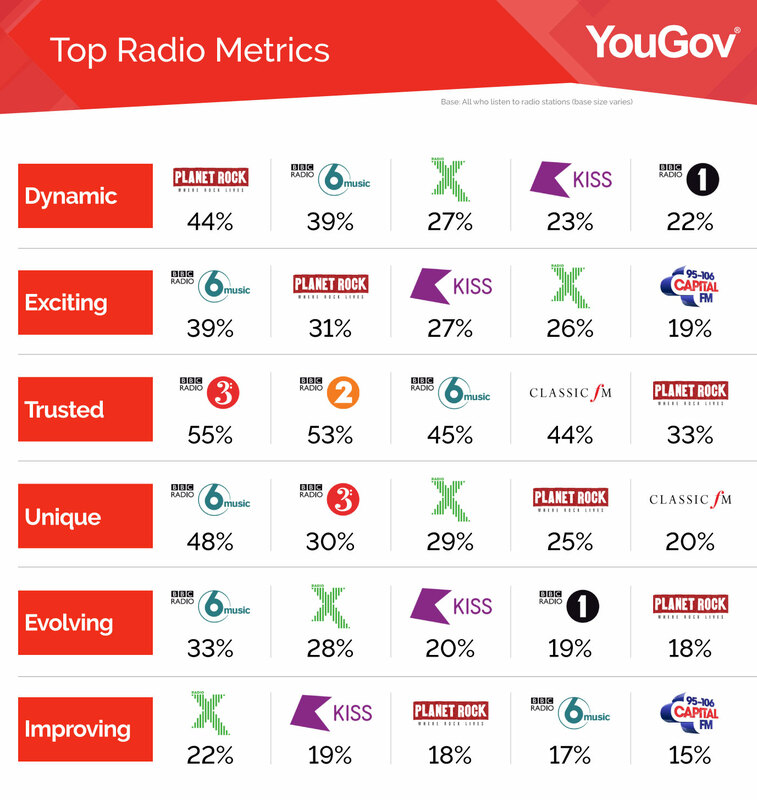 New data from YouGov reveals that BBC 6 Music is seen as the top music radio station in Britain across several metrics, with other ‘genre-specific’ platforms also performing well among listeners. The research, drawn from YouGov’s Music Report, shows that BBC 6 Music tops the list on five of the twelve metrics assessed. For example, it took top spot in terms of how ‘innovative’ a music radio station is, with close to two thirds (65%) of listeners asserting that 6 Music fits this description. This placed it well ahead of BBC Radio 3 (26%), Radio X (24%) and Planet Rock (24%). 6 Music also topped the listener rankings on how ‘relevant’ a station is (55%) and whether a platform is exciting (39%). For both of these metrics, Planet Rock appeared in second place (with scores of 46% and 31%). The other metric rankings that 6 Music topped were those relating to how ‘Unique’ (48%), ‘Evolving’ (33%) a station is. Looking at those metrics that were not topped by 6 Music, the study reveals that in terms of the station that is ‘trusted’, BBC Radio 3 (55%) takes the leading position. BBC Radio 3 is also the station seen as best representing ‘Quality’ (69%). The station that is seen to be improving most is Radio X (22%). Wider YouGov data indicates that just over 5% of the public has listened to 6 Music in the past month. It is clear from our study that while this listener base may seem small compared to some of the industry giants, the station has clearly built up a devoted fan-base that are invested in what it does, and what it represents. As the station moves forward with a new schedule, it can be confident that up until now it has been close to note-perfect for those tuning in. 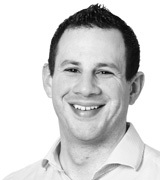 the challenge of course is to attract even greater numbers, while not compromising on its ethos.